“We guarantee complete customer satisfaction.” -David Hancock, Spectrum Industries President/CEO Complete customer satisfaction, community involvement, and innovation employees are a couple key dynamics that contributed to Spectrum Industries recent achievement. 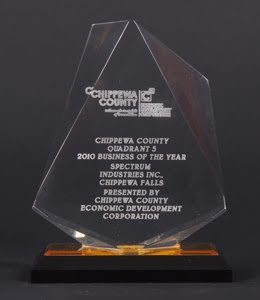 Yesterday, Thursday, May 13, the Chippewa County Economic Development Corporation (CCEDC) announced its 2010 Business' of the Year, and Spectrum Industries was named the 2010 Business of the Year Chippewa County (Quadrant 3 for Chippewa Falls location). Since April 1968, Spectrum Industries has been providing high-quality furniture and product solutions to businesses and educational institutions; in 2009, over 1,700 different products were manufactured and shipped from the Chippewa Falls-based facility. As many educational institutions and businesses have downsized during the recent economic downturn, Spectrum sees the current marketplace as recovering. Spectrum strives to strategically plan ahead for future changes and opportunities. One of the ways Spectrum has maintained its longevity and strategic goals is through the quality products it produces. “We guarantee complete customer satisfaction,” said David Hancock, Spectrum Industries president. 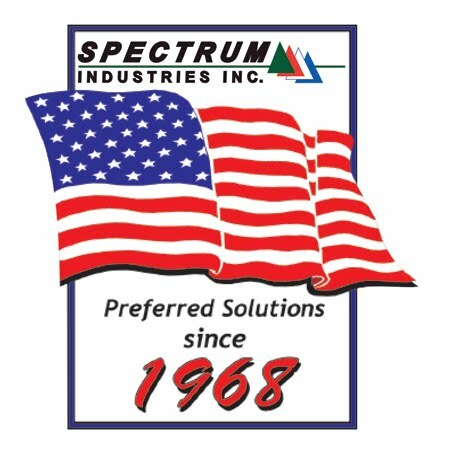 Customer satisfaction is a top priority for the approximated 200 employees at Spectrum Industries; additionally employee satisfaction is important to management. Spectrum is especially pleased with the hard working, and innovative workforce available in the Chippewa Valley. “These attributes are at the core of our success and will be the reason we continue to expand and succeed moving forward,” said Hancock. Spectrum gives back to the community in which it operates. It currently supports Junior Achievement events, sponsors a Relay for Life team and supports the United Way to name a few. Community involvement offers a way for Spectrum to impact the Chippewa Valley through volunteerism and other events. To show the company’s commitment to social responsibility, being an ethical and community-minded corporate citizen is one of the tenents of the Spectrum Industries’ mission statement. This mindset has led to the pursuit of environmentally-friendly operations and sustainability endeavors. Spectrum is proud of the acknowledgements and awards it has received; including the most recent recognition - 2010 Business of the Year Chippewa County. “Receiving recognition affirms that our decisions have been good ones for the company, for our employees and for the community,” said Hancock. “With so much to offer, there is a bright future for all of the existing firms in Chippewa County and a significant draw exists for bringing in new employers and organizations."